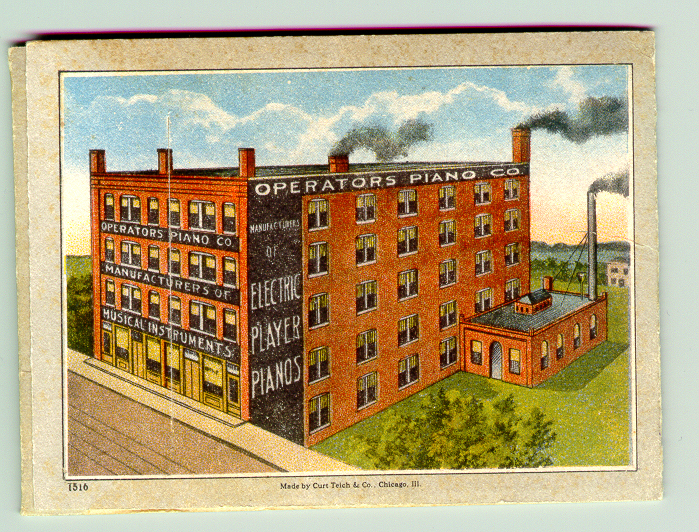 These are postcards and pamphlets from the Operators Piano Company who sold the Coinola and Reproduco brands of pianos. 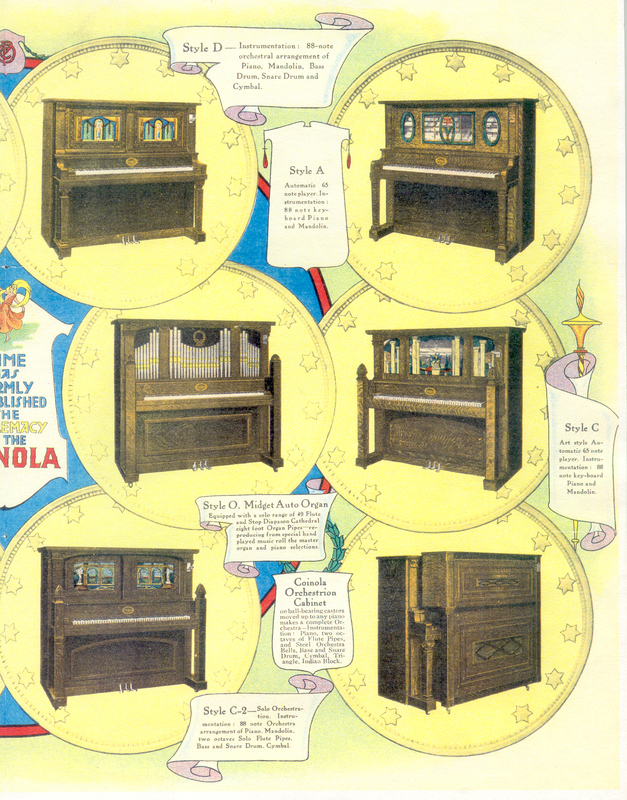 In various collections today, and on some other advertising posters, the Model D (known as the Drum Piano) sometimes was sold as the model K with Violin and Flute Pipes. 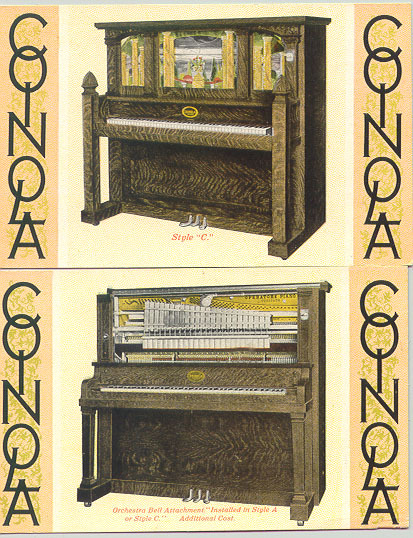 The Coinola C case, when used for pianos with mandolin and piano only, is known as the Coinola C. The Coinola C with an extra instrument, such as a xylophone, became known as the CX. 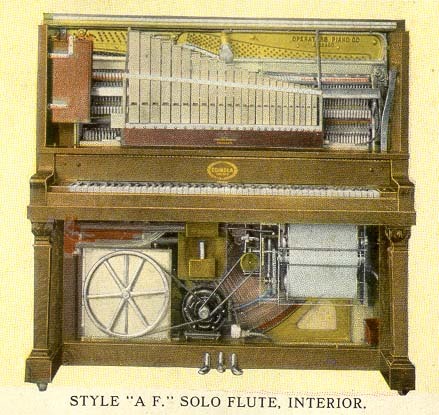 The Coinola C with pipes is known as the CF; it had flute pipes. 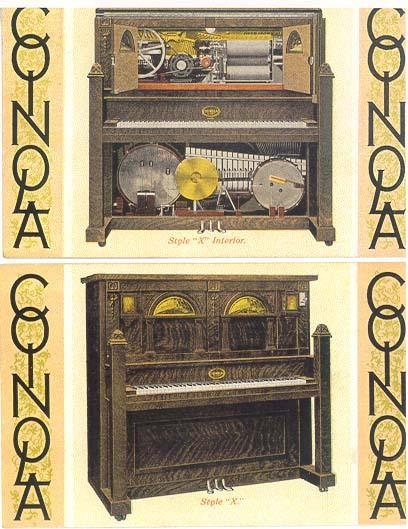 The Coinola C case design can also be found with a mechanism that played a ten-tune expression roll. 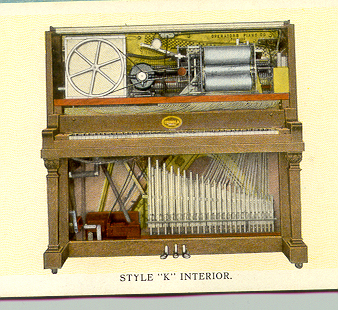 This is a Coinola Expression model. 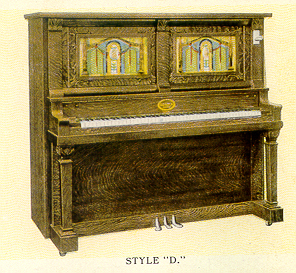 There was also a case designation known as the style J. 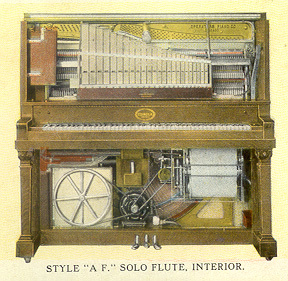 The J was a slightly less expensive case than the C and could be ordered with the same insides as the C. With the appropriate insides these would be known as J ( piano and mandolin), JF (piano, mandolin and flute pipes), JV (piano, mandolin and violin pipes), JK (piano, mandolin, violin and flute pipes) and JX (piano, mandolin and xylophone). 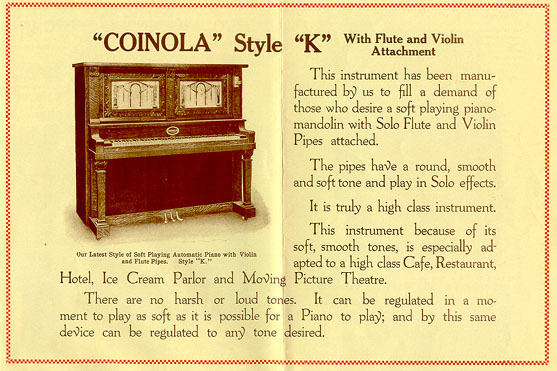 I have never seen any information on a Coinola CK but then, who knows, one could exist. 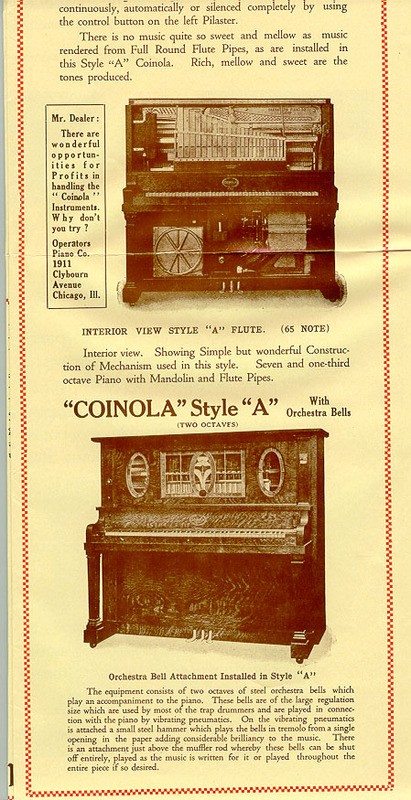 Typically the Coinola with an extra instrument uses the "O" roll, but they can also be found with original "A" mechanism. 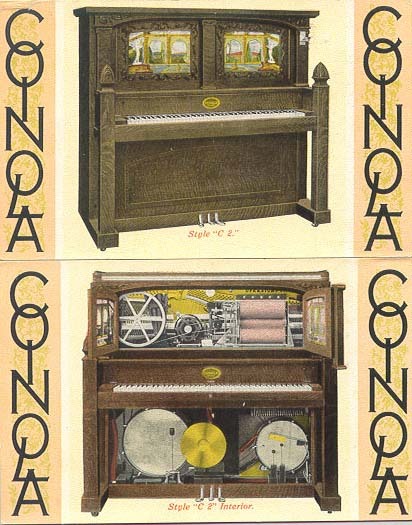 The illustrations below are three fairly common Coinola pianos that are often found with A-roll mechanisms. 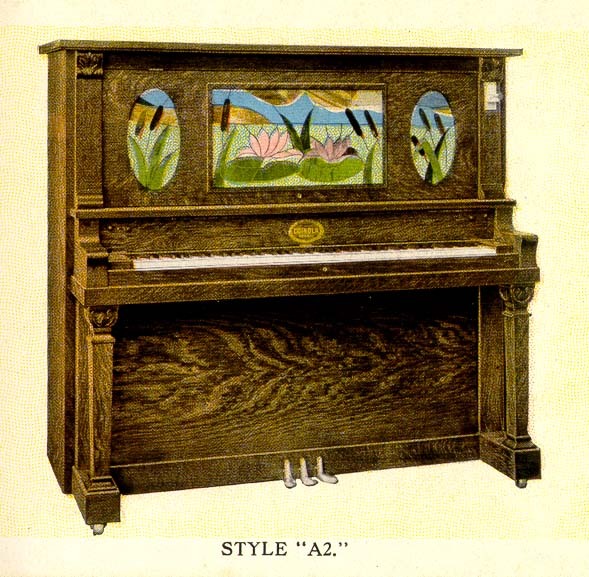 These pianos are not in the Bowers Encyclopedia but are often seen in collections. 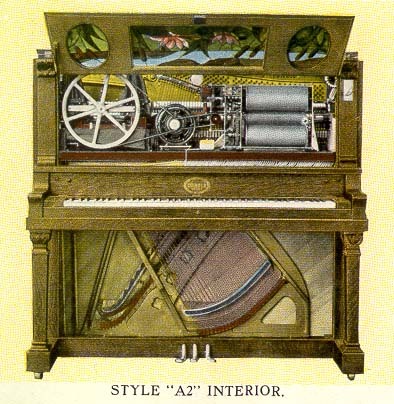 The original literature shows the A-2 Coinola with an O-roll mechanism. 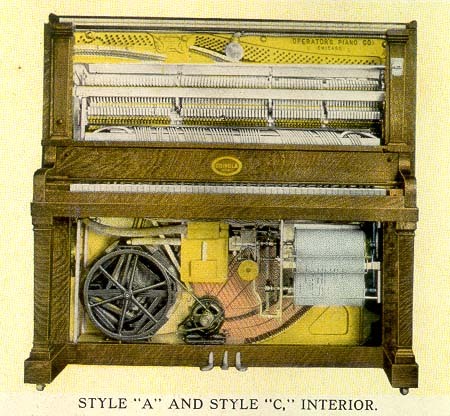 These are pictures of the insides of Coinola AF, A&C and A-2. 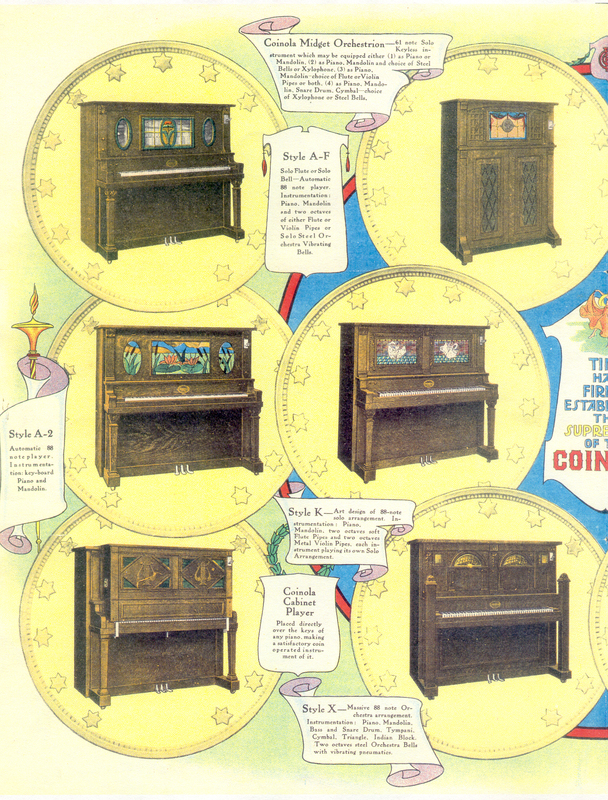 These pictures are from a brochure that folds out to show the different Coinolas. It is just a little bigger than a business card. 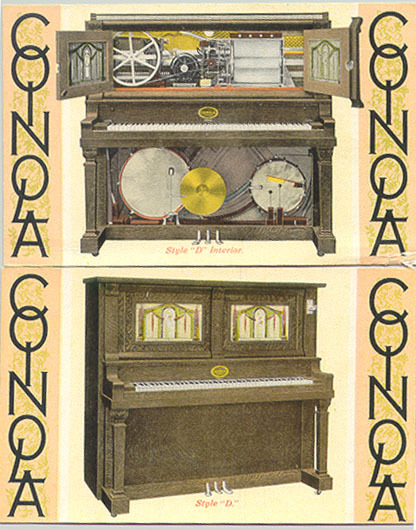 Coinola instruments are scare today but can be found. 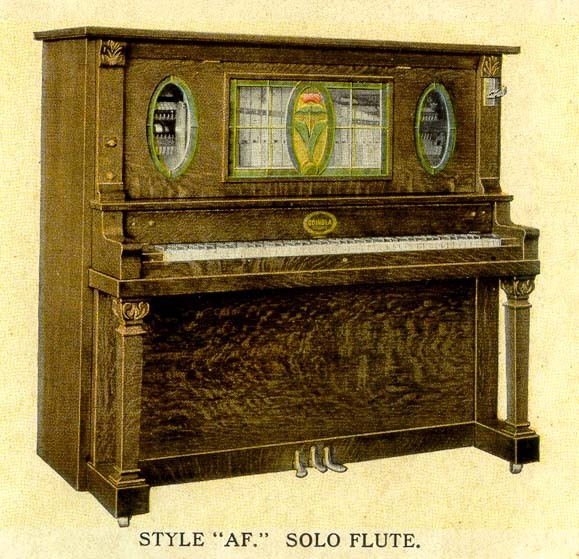 They are very good pianos. Just when you say someone never made something, then one usually shows up. 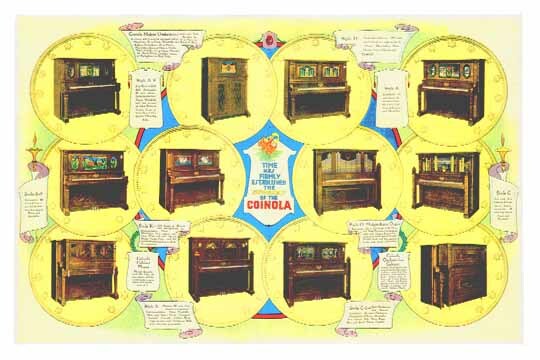 This Coinola color poster has never been reprinted. 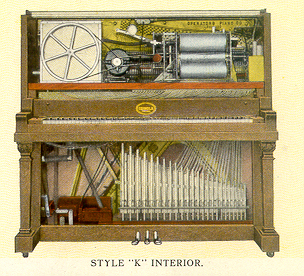 The styles shown are A, A-2, A-F, C, C-2, D, K, X, O Midget Auto Organ, Coinola Midget Orchestrion (keyboard-less cabinet piano), and the Coinola Orchestrion Cabinet (push-up player). 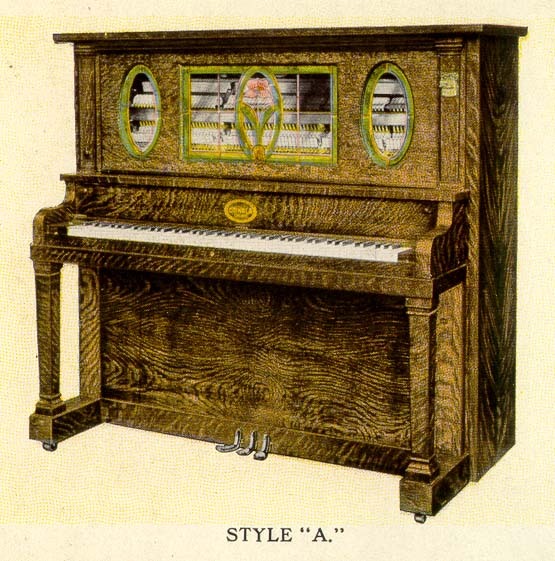 An essentially similar keytop player, probably built by Operators, was sold by Lyon & Healy as the "Little Empress" electric cabinet player. I made two high-resolution JPEG image files of this poster which can be downloaded and printed and then spiced to make a poster about 11 x 17 inches at 150 dpi resolution. The files are huge !